SOLD L' America Settentrionale in Autumn Sale! Title: 'L' America Settentrionale. Nuouamente corretta, et accresciuta secondo le relationi piu moderne, da GVGLIELMO SANSONE Geografe di S M Chrisftianis. E data in luce da GIO GIACOMO DE ROSSI, in Roma nella sua Stamperia alla Pace. l'Anno 1677'. From Rossi's Mercurio Geographico. 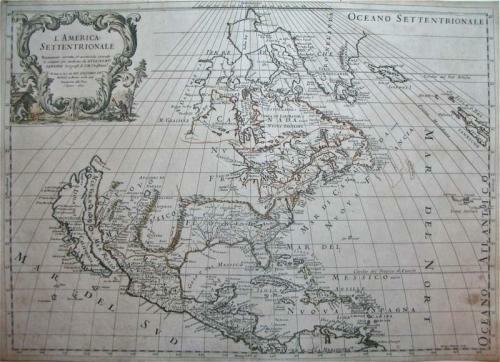 The first edition of Rossi's map of North America, based upon Sanson's seminal map, but with revised Italian nomenclature. Includes a detailed California as an Island on Sanson's model, and early open ended Great Lakes (one of the earliest appearances of the 5 Great Lakes).